Drivers beware: challenging an unfair parking ticket in Los Angeles could subject you to increased fines, hours of appeals, cancellation of your car registration and threats of a withheld tax refund. LA's parking ticket dispute system appears designed to get you to pay, rather than fight, an NBC4 I-Team Investigation has found. "It's extortion," says Bill Seers, who got an "expired meter" ticket in downtown LA, less than an hour after he paid for two hours of parking. The city threatened Seers, in a letter, with "interception of your state income tax refund" if he didn't pay the ticket. LA has been dismissing fewer of the more than 2.6 million tickets issued every year, while revenues from parking tickets are on the rise. In 2007, 50 percent of disputed tickets were dismissed during initial reviews by LA's Parking Violations Bureau. By 2012, less than 34 percent of drivers who fought tickets had them canceled. In 2007, LA collected $125 million in total ticket revenue. By 2013, LA collected more than $157 million in parking ticket revenue, the third-most nationwide after New York and Chicago, according to ticketzen.com. Stuart Rigby got a ticket in March, purportedly for parking in a restricted, permit-only parking zone at 600 Burnside Avenue. But Rigby was actually parked at 660 Burnside, in an unrestricted zone. Rigby contested the ticket with a letter and photographs showing he was legally parked. The next month however, a letter to Rigby from the LA Parking Violations Bureau claimed "an initial review" found his citation "valid." "I believe the system is rigged against the people," he said. "I think it's corrupt." The I-Team asked Robert Andalon, who heads the Parking Violations Bureau at the LA Department of Transportation (LADOT), to review Rigby's case. "Based on the information that's been provided, it contradicts the ticket," Andalon said. He acknowledged that the officer made "an error" and LADOT dismissed the ticket. Does the city of LA review evidence from drivers who say they've been unfairly ticketed? The I-Team got conflicting answers from two different LADOT officials. LADOT spokesman Jonathan Hui told the I-Team that evidence such as photos, video, or credit card receipts which might prove a ticket was unfair are not examined when a citizen initially disputes a citation with the Parking Violations Bureau. "It's not an exhaustive review," Hui said. But Andalon insisted that agency workers "read the correspondence, the photos, anything that's submitted, they do review when determining whether the ticket is valid." 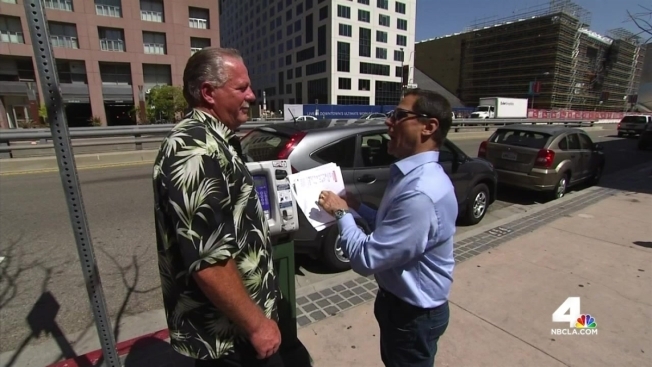 Seers doubts that anyone looked at the documentation he sent the city, after he was wrongly ticketed on Grand Avenue in downtown LA last November for an "expired meter." Seers sent the city his credit card statement showing he paid the city of LA for two hours of parking, but got ticketed after less than an hour. He never received an answer from the city to his appeal to get his ticket dismissed. "Something isn't right," Seers said. "They are not doing their job properly." The city claims a notice mailed to Seers requesting his credit card number came back undeliverable. Two "overdue" letters from the city did manage to find their way to Seers, notifying him that his ticket - and late penalties -- had soared from $63 to $175. Seers requested a hearing on the matter. In response he received a "delinquent" notice from the city and a threat that his state tax refund would be intercepted if he didn't pony up the $175. In addition, the notice stated that the DMV had already been instructed not to renew his car registration. "To me, that's a form of extortion," Seers told NBC4. "They kind of got you in a spot where you are going to pay this ticket whether you like it or not or whether you agree with it or not." The I-Team asked Andalon of LA's Parking Violations Bureau to review Seers' $63 ticket, and the subsequent fines totaling $175. Andalon concluded Seers "didn't do anything wrong" and dismissed the ticket. Disputed tickets issued in LA are handled via a contract with Xerox, which in turn farms the work out to a sub-contractor, PRWT Services, an outsourcing provider for government agencies. According to the company website, PRWT has been processing LA's parking tickets since 1991. PRWT declined the I-Team's request to visit its downtown LA office to observe the process of reviewing contested tickets. If a citizen has questions for PRWT about their appeals, there is no number to call. If a request to have a ticket dismissed is denied, the only way to talk to a live person is to schedule an administrative hearing. "It's extremely difficult to fight these things," said Shawn Nee, who contested a ticket for allegedly blocking a driveway. Though Nee sent photos and video to the city "initially" contesting the ticket, he received a form letter saying, "there is insufficient evidence to dismiss your citation." So Nee took half a day off work, went to an administrative hearing, and showed the hearing examiner the same video and photos he'd sent in the mail. Examiner D. Beckum found Nee's evidence "credible, persuasive, and convincing" and dismissed his citation. Nee doesn't understand why the ticket reviewers at PRWT didn't dismiss his ticket months earlier. "To me, it seems like they are accountable to nobody but themselves," he said. LA's Parking Violations officials stand by their system. When NBC4 asked LADOT's Robert Andalon, "Can you understand why citizens feel this process is rigged against them?" he replied, "Not really."